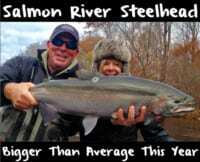 Last year at this time steelhead fishing in Upstate NY wasn’t yielding positive results. Many of the rivers, creeks and bays along Lake Ontario’s eastern shore were locked up with ice, boat ramps were inaccessible, temperatures were frigid and for the most part anglers weren’t finding too much success. Fortunately, Mother Nature isn’t unleashing another record cold, miserable winter on Upstate NY again this year, at least not yet. Flying into Syracuse Tuesday, my flight wasn’t delayed due to weather, there was barely any snow on the ground, I could walk to my rental car without layering up and for the first time in years I didn’t pull into a hotel parking lot with three foot snow drifts. Conditions were more mild. Yesterday, we didn’t need the heater on the drift boat. I had to take my parka off a few times because it was too warm and while filming Pautzke Outdoors with Pautzke pro staffers Kevin Davis of Catch the Drift and Andy Bliss of Chasin Tail Adventures I only made one cast – simply because I was too busy filming Davis and Bliss catch one quality steelhead after another. There was no time for me to cast. They were catching too many fish and steelhead much larger than we expected. After the poor season many Lake Ontario tributaries saw during winter last year (and the past few years) the action left me optimistic. At the very least anglers targeting Lake Ontario tributaries can find open water this season rather than waterways clogged with ice. What the heart of the season brings remains to be seen but boating more than a dozen steelhead in four hours brings hope. Davis and Bliss, both veteran guides, spent the day float fishing. While we only fished three small spots (due to time constraints and filming how-to stuff) action was consistent in each spot. In fact, had we spent more time we probably would have caught many more. 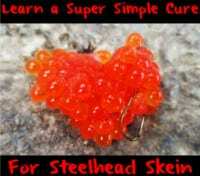 All our action came on cured single eggs fished on six and eight pound test. Our arsenal consisted of Natural and Orange BorX O Fire cured brown trout and steelhead eggs, all fished in various color spawn sacks. Throughout the day the bite did change on which color sack the steelhead wanted. There wasn’t one color that dominated the action. Not surprising most of the bites came on the edge of fast moving water. The heaviest current didn’t harbor steelhead whereas current breaks and slower water did. What was shocking is how aggressive the steelhead were even in water only a tad warmer than freezing. Rather than putting up a short fight after being hooked and then coming in easy these fish fought hard till they reached the net. Of the dozen fish we caught and released most ranged from eight to 12 pounds and about a third were fresh chromers. We didn’t catch any browns, although we didn’t target them either. Editor’s Note: Pautzke Outdoor’s newest episode Oswego River Steelhead Fishing will be released later this winter. For more information on guided drift boat trips on the Oswego River please visit www.catchthedrift.com and www.chasintailadventures.com.